The OK2BME Leadership and Recreation Group is an empowering space for young (15-18) LGBTQ2+ people to come together and hone their leadership skills, and socialize with one another. This group is designed to support youth aged 15-18 in engaging in recreational and leadership opportunities. The youth who attend will be responsible for planning OK2BME’s annual holiday party, and for having a presence at the tri-Pride Festival and our Pride Prom. When do you meet? We meet bi-weekly from September until June on Tuesday evenings opposite from the weeks that our group for 12-14 year-olds runs. What do you do? 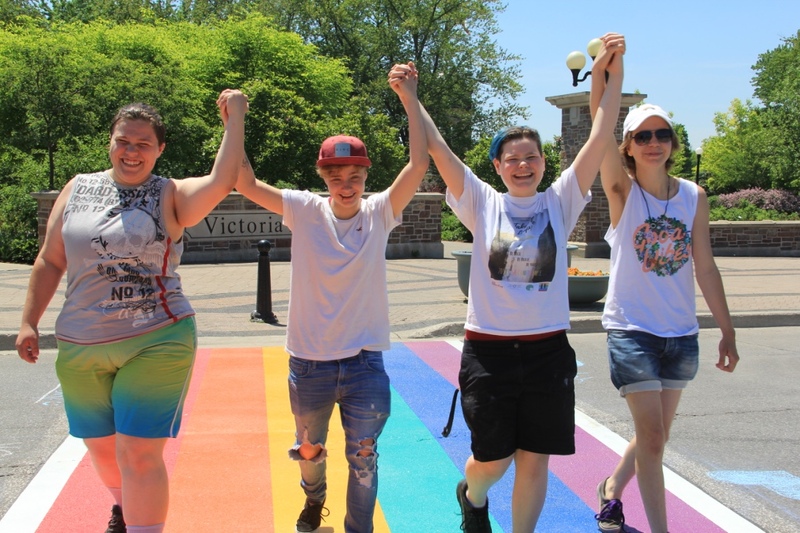 We help make Waterloo Region a better place for LGBTQ2+ Youth! We do this by creating supportive and safe places for ourselves and other youth. Who is in the group? The group is open to anyone age 15-18 in Waterloo Region who wants to work towards creating a richer community for LGBTQ2+ Youth. How Can I get involved? Visit our calendar for a schedule of our meetings and/or Like us on Facebook for updates. We meet at KW Counselling Services located at 480 Charles St East.